You don’t have the budget and you are looking for a responsive, beautiful and professional looking HTML Theme for your next website. 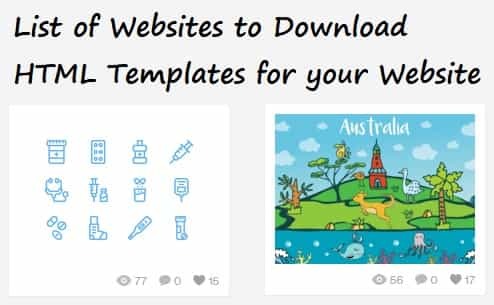 Good, in this article I have listed some free websites on the Internet where you can regularly find good templates for use in your web projects without restrictions. It is the popular community of designers for them to showcase their work online. Here designers also upload the HTML / CSS version of their projects for anyone to use. Also, they post screenshots of their work. You must bookmark it to never miss these projects. It is a premium marketplace for website templates like WordPress themes, web templates and more. Brought to you by the largest global community of creatives. If you create a free account on Themes Forest then you can download all the freebies that are published on their homepage every week. These templates are paid that authors have made free only during the duration of the promotion to gain visibility in the marketplace. Like as the name freebies including fonts, stock photos, PSD designs and, of course, HTML templates. You need to go on the “exclusive” tag for discovering HTML/CSS templates that the designers have chosen to share exclusively on this website. It is the marketplace for website themes, templates, fonts, and other design assets you can get from there. They’ll send you free design stuff every week in your inbox that can be downloaded directly to your Dropbox. To get the free template you need to join their email newsletter because it is a paid store. It is one of the most useful websites on the Internet and developed by the same developer that built Card. All web templates are available in the Creative Commons license so can you can use them in any way with attribution. On the internet, it is the treasure house of beautiful templates, the heavy Bootstrap framework. Their web section offers a variety of HTML templates that are free for both personal and commercial use. Another online community and marketplace where creative designers share their templates. They have a dedicated section for HTML templates that are free to download. From OnePageLove you can get a single page website.